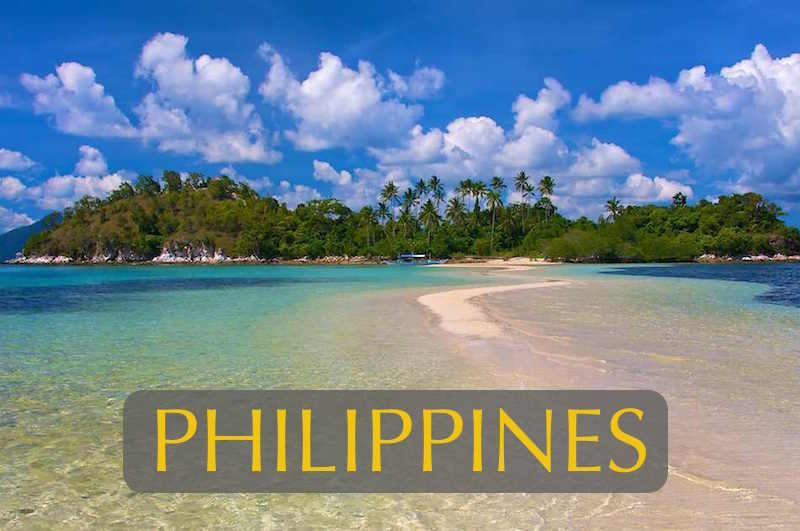 The Philippines are blessed with over 7,000 of the world’s most beautiful islands, one of the most pristine of which is Palawan… a long jungle clad isle that nearly connects with Borneo. Palawan has been voted ‘Top Island in the World’ by the prestigious publication Conde Nast Traveler, the past two years, but the real gem in Palawan’s crown is the area in the far north known as El Nido that has been called “a paradise within a paradise”. Here towering limestone crags covered in emerald forests rise dramatically from crystalline waters. Hidden lagoons, sea caves, secret coves and some of the world’s most beautiful beaches are nestled in amongst a labyrinth of islands. It is a perfect outdoor classroom for students to study coral reef ecology, intertidal zones and mangrove ecology, the geology of karsts and caves and stream ecology. Students on this trip will learn about the complexity of and interactions between neighboring ecosystems. In doing so they will snorkel and collect data in some of the world’s richest reefs, conduct intertidal transects, kayak into ancient collapsed cave chambers, boat through mangrove estuaries, capture, mark, release and recapture hermit crabs to determine population density and conduct comprehensive stream studies in an analysis of biotic and abiotic factors. A full day service project is built into this program where international school students will do repair projects and interact with over 200 village children at a remote fishing village school. By kayaking, snorkeling, swimming and hiking every day, student’s will not only improve their health; they will rejuvenate their minds in a setting of unmatched splendor. Looking to bring your science and social studies lessons alive for students in a stimulating setting? Try a classroom in paradise. Students arriving in Manila on international flights will be transferred to ITI domestic airline terminal for a 55-minute flight to El Nido. (Note: If arrival time in Manila is too late to make connections on the 3 daily domestic flights, students will be accommodated at Wings Airport Lounge with twin beds, hot shower units and a lounge offering free refreshments). 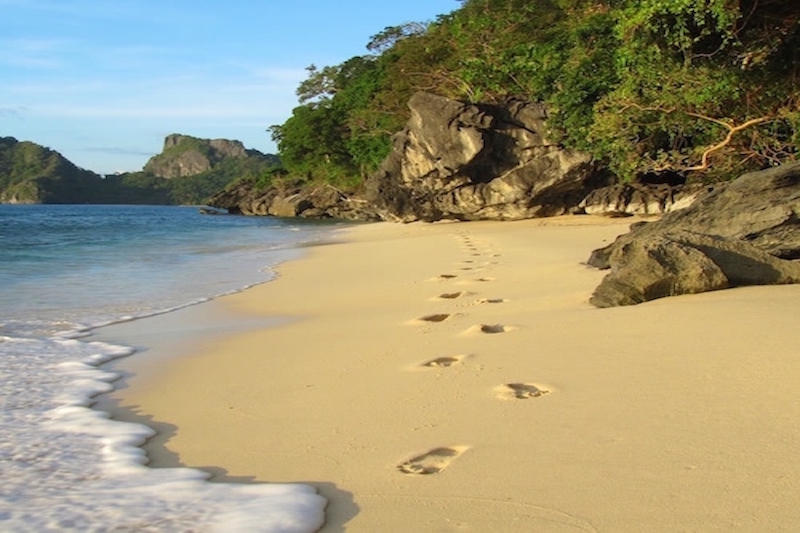 If flight connections work, it’s just a short drive from El Nido’s runway to our resort located on a beautiful undeveloped coastline north of El Nido Town. Students’ will be assigned rooms, eat lunch and then gather at poolside for a trip orientation session. During a late afternoon hike along the beach, students’ will inventory the flora and fauna of the coastal forest and be taught by local guides plant uses for medicinal and construction purposes. Endemic wax plants (Hoya el-nidicus) are among the flowering plants found here and nowhere else. Shore birds, stork-billed kingfishers and white-breasted sea eagles are easy to spot along the beach hike. After a delicious sunset dinner this evening, we will have a lecture on island endemism as well as the geology of karsts and caves in preparation for our sea adventure the following day. No one will want to miss the glory of sunrise as the sun slowly illuminates one of the world’s most dramatic coastal landscapes. Students wanting to do a morning jog down the beach, or find a quiet place to calm the mind and take in the serenity of the morning will not be disappointed. Right after breakfast we set off aboard a charter outrigger boat to some of the most amazing karst settings and coral reefs El Nido has to offer. Exploring hidden lagoons formed by collapsed cave roofs, students will come to understand the geological evolution of El Nido’s karst landscape that started out as a living coral reef 230 million years ago. The main focus of this day will be coral reef ecology and students will be taken to some of El Nido’s best snorkeling sites to conduct an inventory of fish and coral species found here. The Philippines are located on the northern edge of the Coral Triangle, the richest place on earth for coral reef life, and new species are being found here all the time. In addition to investigating species diversity at various dive sites, students will also be made aware of threats to El Nido’s reefs. Anchor damage to reefs will be noted at the most visited sites as well as fishermen’s nets that get hung up on reefs and break delicate corals or smother them. 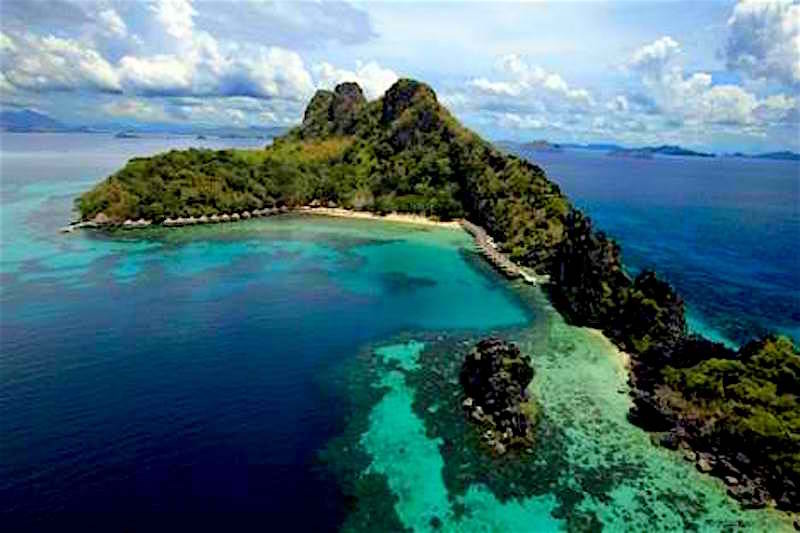 A report on this survey will be submitted to the El Nido Municipal Tourism authority. Returning to our resort from a full day at sea, everyone will clean up before enjoying a delicious buffet dinner after sunset. Waking up to another glorious day in paradise, students will enjoy a big breakfast before packing up and setting off by air con mini vans across the northern portion of Palawan to the Dewil River. Here students will be transported by boat through a mangrove forest to learn about the many unique adaptations tree species have evolved to live in salt water. 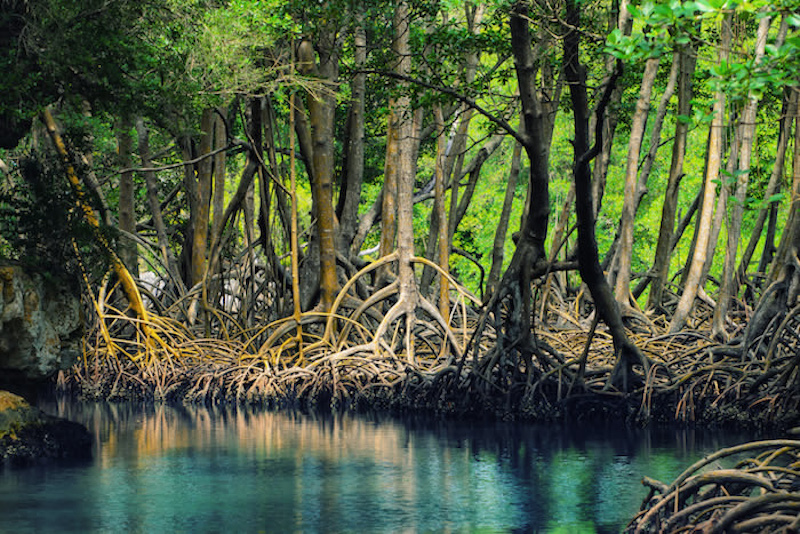 They will also consider different reproductive strategies, like nippa palm seeds that are genetically programed to only germinate where fresh and salt water converge, or red mangroves that sprout their seeds before they leave the parent tree and only drop their long seeds into the mangrove mud at low tide. 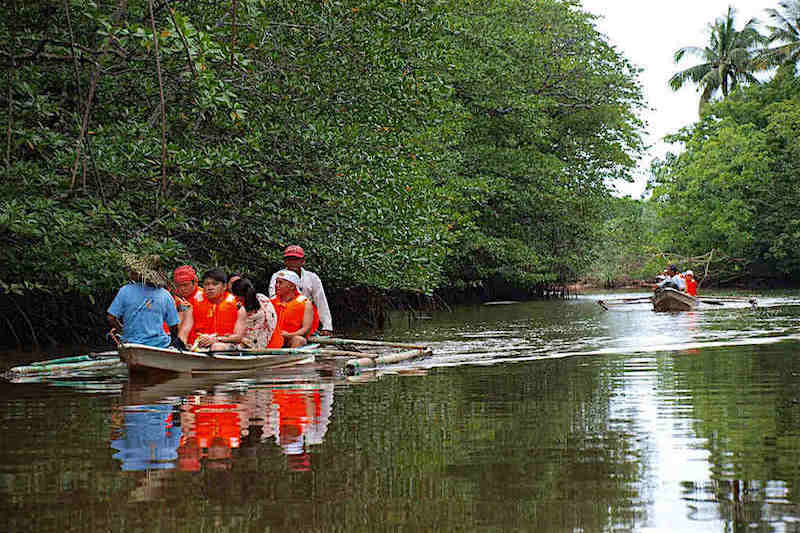 While exploring the mangrove forest and looking for fauna like mangrove snakes, kingfishers, crab eating macaques and other species, students will also learn about the many ways in which mangrove forests benefit people – providing foods, medicines, building materials and protecting coastal villages from storm surge and tsunamis. Following our mangrove jungle river cruise, we return back across the island to Nagkalit-kalit Waterfall where we will enjoy a picnic lunch. During the 45-minute hike to the falls through beautiful rural landscapes and tropical rainforest there will be many opportunities to learn about Palawan people’s lifestyles and special features of the Philippine rainforests. If lucky, students might spot the endemic and very beautiful Palawan hornbill. Arriving at the falls, students can enjoy a swim in the deep pool before spreading out downstream to conduct a biotic and abiotic stream inventory. Armed with dip nets, collecting trays and macro invertebrate identification charts, students will collect and identify as many benthic stream organisms as possible. During their search, students might also find a unique vertebrate – the Philippine toad– an endemic species to Palawan. Following the biotic analysis of the stream bed, students will then do an analysis of abiotic factors by testing the water for temperature, turbidity, dissolved oxygen, pH, ammonia, nitrates and phosphates. Following the stream study we drive a short distance to Nacpac Beach, a glorious 4-km long expanse of surf swept sands that will be our home for the next two nights. After checking into beachside bungalows, students can wash up before a delicious dinner served at sunset. After dinner we will gather in a beautiful open-air pavilion to review the service project we will engage in the following day and to reflect back on our days adventures. Students may want to go for a long run at sunrise on the spectacular beach that fronts our lodge before sitting down to a hearty breakfast. Everyone will hike down the beach this morning to Caligan Village where we will conduct a full day of service at the village elementary school. This poor fishing village of nipa palm thatched huts is very proud of their school and the opportunities it presents to their children. International school students will assist in repairs and renovations to the school structures as well as engage in games and lessons in world geography with the local children. As most of these children speak English as well as Tagalog, the interactions with international students should prove quite rewarding. A picnic lunch will be served at the school grounds before completing our project in the afternoon. Together with some of the students we will then explore the fishing village and learn about their daily lives … building boats, fish traps, mending nets, etc. International school students will discover that these kid’s parents are professors in their own right with their knowledge of the sea and fishing methods. Before returning to our lodge, we will hike up to a viewpoint near the village that offers a sweeping view of two bays connected by a narrow isthmus of sand. Returning to our lodge, there will be time to play in the waves and enjoy some group games on the beach before cleaning up for dinner. After dark, students will be taken to a dark area of the beach to view the spectacular night sky and learn to identify different constellations in this remote region of the Philippines with no light pollution. There’s another great opportunity for students to jog down El Nido’s longest beach this morning before breakfast and packing up to leave. 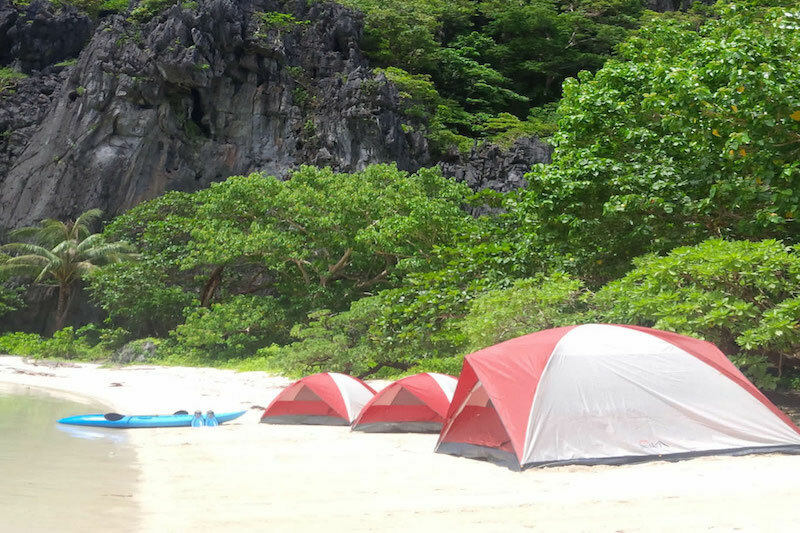 We return by mini van to El Nido Cove Resort and have time to sea kayak, beachcomb and swim in the pool while awaiting the low tide. A lesson in intertidal life will be conducted before students take part in an inventory study. When the tide is low we will set out a belt transect from the lowest point to the high tide line and inventory all intertidal species in quadrants set several meters apart, along the line. Following this exercise, students will analyze their data to determine which distance from the shoreline supported the most species and where some selected species had their greatest concentrations. After dinner this evening, there will be a study session on islands, their geological formations and uniquely evolved flora and fauna. Today after breakfast at our resort, we set off on a two-day Sea Gypsie adventure … exploring the many wonders of El Nido by boat along the way to a remote island campsite. This time our focus will be on transition zones, those blurred boundaries between what scientists categorize as distinct ecosystems. Our 2-day trip will include many more opportunities to snorkel and swim at amazing locations as well as enjoy delicious, fresh seafood barbeques on unspoiled beaches. Waking up in a remote island camp is an experience students will never forget. Sea turtles, dugongs and manta rays are most active in these early hours before the day visitor boats arrive. We will enjoy breakfast on the beach and another full day to island hop, snorkel, swim and fish for our lunch. Returning to our lodge in the late afternoon, we will enjoy our final dinner together, and prepare for a closing ceremony where each student will be awarded a trip certificate and have an opportunity to share their favorite memories in a closing candle circle. After breakfast this morning, we transfer a very short distance to El Nido’s small airport for the flight to Manila and international connections home. Note: If international connections can not be made on the same day, this flight can be delayed until late afternoon and students will have more time to relax and enjoy the resort amenities: swimming pool, kayaking, beach strolls, volleyball and table tennis. Students will then be accommodated overnight in Manila at the Wings Airport Lounge for early morning departures the next day.